I make very similar soups whenever I have ingredients I want to use up and I think Jacques Pepin included this recipe as an inspiration. By itself, it's a plain soup for sure but what a great base for making it your own. I started out by using some pork and chicken bones I saved from bbq night before as a stock. Simmered for 20 min and added the vegetables including Parmesan rind I always have on hand for adding to soups. He gives us options for different starch to add the volume and I added broken angel hair pasta instead of grits. Added a bit of sugar and pronto, very satisfying instant soup in 30 min. Used 6 small frozen lobster tails.. Removed meat and added to soup at end. Used fish broth instead of lobster broth. Just perfect for quick light lunch using what we normally have on hand. And not only that, the taste is so satisfying and delicious. As I've gotten older I relish these quick, frugal, and perfect serving sized portions of deliciousness. I added a little leftover miso salmon pieces from night before. I’ve had this cookbook for years. Why haven’t I tried this recipe before? Extremely fast and simple. Great as a dip. Utterly delicious! When Jacques says bake 15 minutes with cheese, believe him. I baked 15 minutes and then put on cheese and then baked 10 minutes more. As a result the cannelloni was overcooked. This will be a great dish when grandsons visit. This was one of the fastest weeknight meals I've ever made. Added some fresh basil on top when it came out of the oven. Fresh and tasty. One of our quick weeknight favorites. Use Wondra flour to get perfect crust on chicken. Served with carrot nib orzo, and steamed broccoli. Very good. A favorite recipe at our house. Quick, tasty, and garlicky! We serve with rice or mashed potatoes. This is one of my favorite quick dinners. It's very good and 20 minutes from start to table, you can't beat that. I serve it with rice. Fast and delicious. The sauce and garnish are both great. Our sons make this at college for friends and get rave reviews. Looks nice on the plate. Pg. 149. 9.3.14. Delicious sandwich. Used left over roast chicken, took a short cut and used Trader Joe's organic jarred mayo with the tuna and anchovies. Worked a treat. For the sandwiches we used Italian rolls. The filling included tomato slices, arugula, thinly sliced sweet onion, the capers and chives. Rather messy to eat so I used a knife and fork. Definitely repeatable. So tasty and so easy. Who knew a mix of odd ingredients (chile, soy, A1 and Tabasco sauces) would make such a delicious sauce. My chops were thicker than an inch, so I cooked them 5 minutes per side, I also brown the edges a bit. Company worthy weeknight dinner. 4.2016 - p. 168 Easy, but could use more flavor. Try adding green peppers, 2-3X onions, subbing bacon grease for olive oil, and more fresh herbs. Flour may have been omitted in error. Cake has no structure. Recommend using favorite brownie recipe instead. Whipped cream could use a bit more flavor. Cooks in a hurry, take heart! Memorable dishes are only moments away with Jacques Pépin's stunning new cookbook. The most celebrated chef in the world - the man who taught millions of Americans how to cook - applies his skills to the food he loves best: simple, special meals that can be prepared quickly. Fast food Jacques's way is as effortless as seasoning a salmon with fresh herbs and nutty bread crumbs and cooking it right on the serving platter in a low oven. And it doesn't get any easier than his Instant Beef Tenderloin Stew, quickly sautéed steak combined with an array of colorful vegetables - brighter, fresher, and far faster than traditional versions. Pumpkin Soup with Toasted Walnuts, Quick Cassoulet, and Caramelized Peaches rely on canned goods (what Jacques calls "treasures in the pantry") and take just moments to make. With Jacques Pépin Fast Food My Way, even a succulent roast can be on the table in thirty minutes. Every dish in this beautifully photographed cookbook is special enough to serve to company. 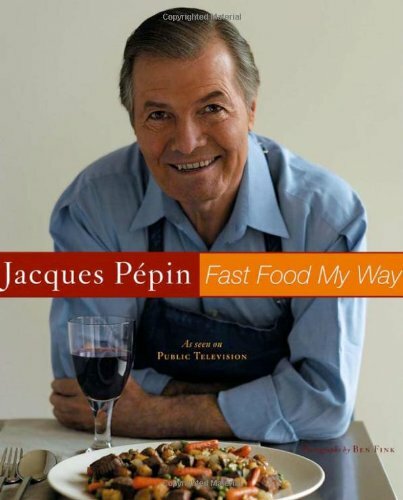 With no tricks, no gimmicks, and no compromises in flavor or appearance, just honest techniques and the lessons of a lifetime of experience, Jacques Pépin Fast Food My Way proves that the best food is the simplest.